Sometimes there is a great deal of tension between the way we are and the way we think we’d like to be. Here’s a little concept I’ve come up with that’s given me more shalom (peace) in my life. Perhaps it will give you some, too. It’s a way of eliminating some unnecessary tension in the gap between who we are and who we want to be. We all have several types of values. The first is “practiced values.” These are the values we are actually living out right now. 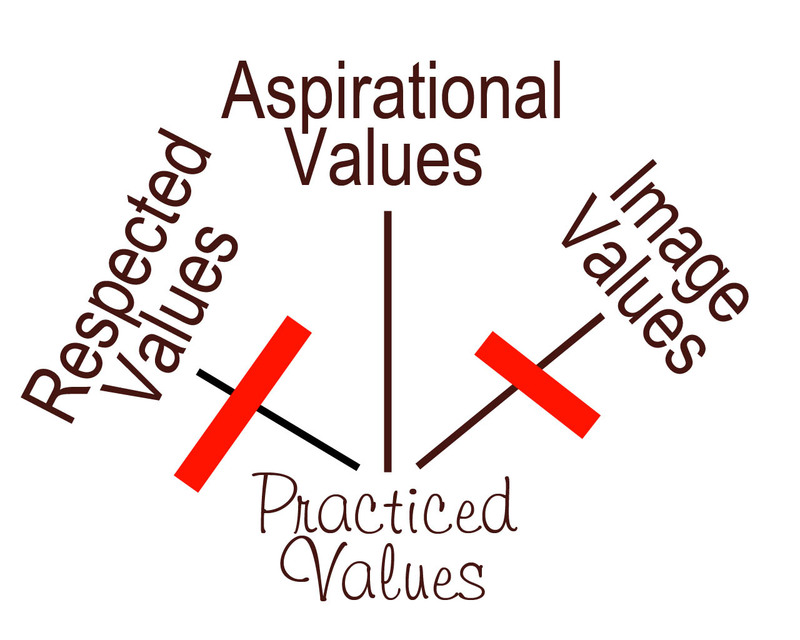 Then there are “aspirational values.” These are the values we would like to see lived in our lives but we aren’t there yet. The gap between these two areas is where we grow. It’s that tender area where we must admit that we are not where we want to be. But we can get this gap confused with the gap between our practiced values and two other types of values that we often seek to grow toward, but should really lay aside. “Respected Values” are the values we see in others that we respect. We make a mistake when we think that we want to adopt a value just because we respect it. For instance, I really respect people who are very neat and completely organized, but that is not my value. I have spent too much time in self-judgment about not being super neat because I respect people who are. But you know what? It’s not really a value to me. I like eclectic and even a little cluttered. It is so peace-giving to simply acknowledge that while I like my office reasonably tidy and organized, it will never be neat as a pin because while I respect that, it’s not really a value of mine. “Image Values” are the values that we’d like others to see in us. How do you want to be seen? Why? Your your goal is to be seen in a certain way, you have handed your peace to someone else. You will never be at rest because you will always be trying to control (and manipulate) how other people see you. This is something you ultimately have no control over. When your values are image-based, you are trying to find your self-worth in what other people think about you. That’s a bad road, fraught with danger and leading you directly away from shalom. This values framework may help you grow in peace. Reflect on your values and goals — the things you would like to be — and see which of those things fit in which category. If they are “Respected Values,” go on respecting them but don’t judge yourself for not moving toward them. If they are “Image Values,” drop them. You are God’s workmanship and nobody else has any business judging you. For your truly aspirational values, continue to work toward them. I suggest you read/listen to a book called “The Power of Habit” to learn powerful ways to change your life. (CLICK HERE to me my post about this excellent book).